Training your new horse can seem like a daunting task. Following a few horse training tips can help you and your horse have a positive training experience. Make sure you gather as much background information on your horse as possible. 1. Do not start training your horse until they are 2 years old. 2. Have a good understanding of natural horsemanship. This technique encompasses a great knowledge of horse behavior, actions, and the fact that they have prey animal instincts. 3. The most important technique in natural horsemanship involves creating a strong bond with your horse before asking them to do anything. 4. An important point in this list of horse training tips is, avoid using whips or riding crops. Horses will remember something they fear for their entire lives. You don’t want your horse to fear anything, they should feel safe with you, then they will respond to training. 5. Make sure you pay attention to the length of time you train your horse. You can train for as long as the horse can respond to your cues and doesn’t seem tired. 6. The first thing you should teach your horse is to lead, these commands taught here will follow all lessons to come. 7. It is always important to train your horse to respond well to farrier work, making sure your horse doesn’t have a problem with you or your farrier touching and cleaning their hooves. Neglecting this process can cause your horse to be physically aggressive towards farrier tasks and lead to horse hoof problems. 8. Start your training sessions with warm ups for your horse. Just like us they need to be able to warm up their muscles, otherwise you can have a lame horse from early over exertion. 9. You will need to train your horse in either Western or English style. 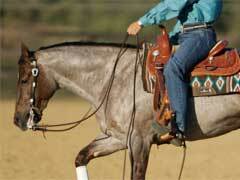 If you choose western then you need to train your horse with appropriate western horse tack. 10. Finally in this list of horse training tips, remember to review previous lessons and commands the next day, repetition is key. Following this list of horse training tips you and your horse will have a satisfying training process.